Join SWIFT and Huntswood for an interactive discussion to help you address your sanctions compliance challenges. In many markets regulators now require you to screen transactions and customers against a number of rapidly evolving sanctions lists. Automated filtering tools, while effective, will generate false positives and false negatives. Follow up investigations must be conducted manually, which is time consuming and risky. This webinar will explain how implementing best practices can help you fulfil auditing and transparency requirements while also improving operational efficiency and reducing costs. Not sure you can join? You can still register as we will be sharing the recording following the event. SWIFT gpi is unrivalled in global payments. No other service can securely deliver hundreds of billions of dollars in payments around the world – timed in minutes or seconds. Unmatched in scale, more than 150 global banks are offering their customers high-speed cross-border payments – tracked from start to finish. Trust us to deliver your global payments – join SWIFT gpi today. Global Financial Institution testimonials, providing an insight into the benefits of the gpi cross border payments platform. We're covering the Sibos conference in Toronto this week and are here to bring you highlights from the fourth day of the event. We're covering the Sibos conference in Toronto this week and are here to bring you highlights from the third day of the event. We're covering the Sibos conference in Toronto this week and are here to bring you highlights from the second day of the event. We're covering the Sibos conference in Toronto this week and are here to bring you highlights from the first day of the event. Global provider of secure financial messaging services. 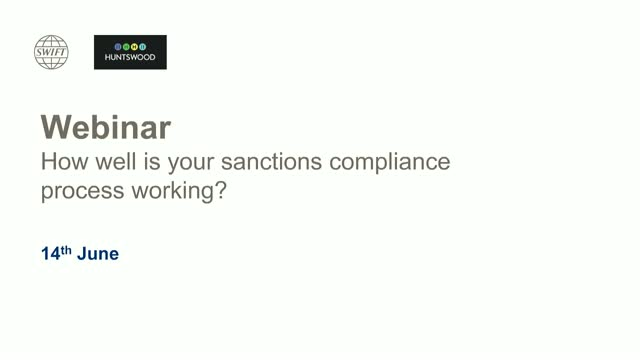 Title: How well is your sanctions compliance process working?